Now some of you may be thinking that Geometry is going to be boring, but it actually is not. Some of the big ideas in geometry include, tangible shapes, circles, finding lengths and proving congruency. Being able to understand measuring shaped and knowing properties that apply. Also, angle measures, and being able to find measures of angles and sides without tools, just with math. Geometry is also concerned with relative shapes, congruency, with rigid motions and transformations. 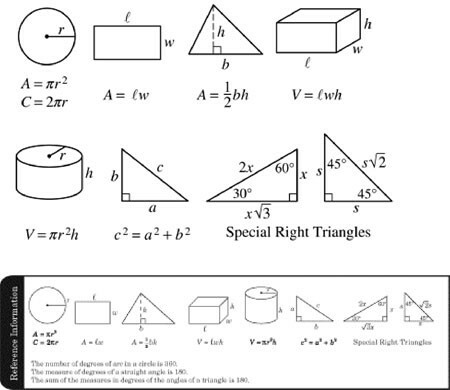 Also, with the properties that make shapes what they are and how to prove them. Proofs- Being able to prove a therom or that something is indeed true through postulates and other reasons that have already been proven. Similar Polygons- Showing that eventhough there is a difference in size their proportion may be the same. Also, they may be similar meaning that all their angles and all their side lengths are in proportion with each other. Similar triangle Theroms- Reasons for which triangles are similar and they apply to all triangles, and can prove all triangles are similar. Proving similar triangles-Almost the same thing as "Similar Triangle Theroms" but it is in a proof form. Similar Triangles- Triangles that have proportional angle measures and proportional side measures. Proportions- It basically means that the sides, angles, and the basic shape are all proportional to each other, meaning that their measures are relative in size. Quadrilaterals in the coordinate plane- In this you can prove that shapes are regular using the distance formula, slope, and y=mx+b form. Finding the area of a parallelogram, Kite, Triangle, Rhombus, or Trapezoid- finding the area of these is useful in later units to find the volume of a solid which is useful in later units, like unit 10. Finding missing angles and sides- This is when trig is necessary and also helpful in finding the missing angles and sides. Using Trig in Everyday life- In everyday life trig can be used to find the hight of a building or even a mountain. The Unit Circle- The unit circle uses coordinates to show angle measures and also radian measures. Finding angle measures- this is helpful because with this you can find angle measures and then you can find the measure of arcs as well. Finding arc measure- the angle measure and also the arc measure go hand in hand, once you find one, you can find the other. Finding the area of a sector- using what you know to find the area of a sector. Finding the volume of solids- The simple area of the base times the height comes into play here, but it also goes much deeper than that. Naming crossections - This is kind of hard to explain, but it basically means if you cut a solid down a line and what shape that will be. For example, if you cut a cone down a vertical line, the cross section would be a triangle. Cavalieri's Principle- essentially states that if two prisms have the property that all corresponding cross sections have the same area, then those prisms have the same volume. Using trig to find the area and later the volume of a solid- Sometimes it is necessary to use trig to find missing angle and side measures so that you can use those to find possibly the height of the solid or the area of the base. Proofs were very hard for me because in math I never thought of proving why something was the way it was. I just always accepted theroms and properties for being true, but if you are like me, you will find that proofs help you understand math much better. 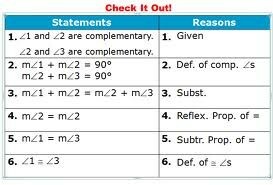 Proofs are not only helpful in math but in all of life! Some people say that they may not need this class to do what they want to in life, but that is definitely not the truth.If you would like to go into any field that is vaguely related to math you need to be able to do proofs and even in some non math related jobs. For instance, engineering, forensic scientist, lawyer, doctor, and many other promising careers. Proofs are something that we all use every day, we just don't realize it. 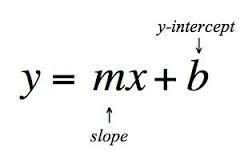 To this day I still do not understand why slopes in the y=mx+b format is still hard to understand, but it just is. When I think of this equation, it just never made sense but I have attached a few good videos that helped me to understand that may help you as well. So many majors today need higher maths like Calculus and Pre Calculus and that is all part of and that make y=mx+b essential to your success. When I was first introduced to trig, I thought it was extremely difficult and that I would never understand it, but it turned out that trig was probably my favorite unit in geometry this year. After I had trig explained to me, it made so much sense that I could not believe that I didn't understand it in the first place. To me to be able to find other side lengths with only another side and an angle was genius! As well as being able to find an angle with only two sides. This was the unit that I found most practical as well as fun! It is so cool to be able to find a simple equation and fill in the numbers to find how tall a statue or a building or even a mountain is. The options and opportunities are limitless with trig. Trig: SOH-CAH-TOA. The first letter means the function, the next means the number on top, the last goes on the bottom. Proofs, if you do not understand them, take you time to break them apart. Smore.com was great. I would recommend Smore.com to anyone who needed to do a project. It was very simple to use and it also made it very simple to insert videos, links, and photos. I had never heard of Smore.com before this project, but I will definately use it again. I like the simple layout of the Smore projects, sometimes I think other sites for presintations get a bit too concerned with the way the information is presented, instead of the information itself. I felt that Smore.com presented the information in a simple and easy to read fashion.